An ampollina is a vessel similar in purpose to the Amphora, but smaller in size. 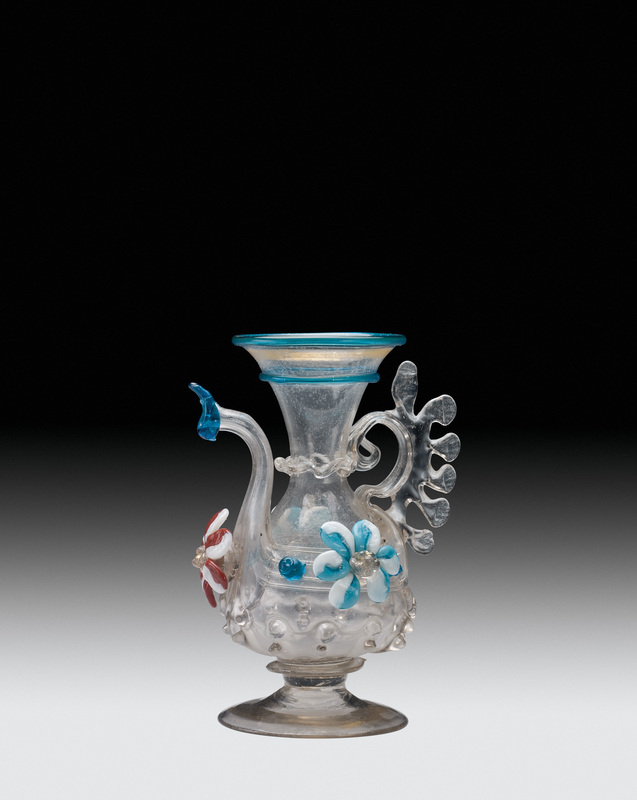 This example has a handle, spout, small flameworked flowers, and a gold-leaf edge. First, the flowers are made by flameworking. Compound rods are made with white and aqua and red glass, and these are reheated in the flame and tooled to create the flowers. Gold leaf is placed inside of a raspberry prunt and placed in readiness. The petals are formed. This is done by softening the glass, pressing it with a tool with a waffle pattern, and then squeezing and elongating the glass. The petals are attached to a soft piece of clear glass. A small amount of clear glass is added to the center and then pressed with the raspberry gold-covered prunt tool. The flower is flame-cut from its gathering rod. The red flowers are made similarly. The flowers are then placed on hold in an annealing oven and kept at about 950 degrees Fahrenheit. The body of the ampollina begins with a gather of clear glass on the end of the blowpipe. This will be decorated with the mezza stampura technique—the half molding. The bubble is elongated and made slightly tapered to fit into the bottom of the dip mold. A small amount of glass is gathered from the furnace and placed on the tip of this thick bubble. The gather is flattened and pushed upward slightly, pressed firmly into the dip or optic mold to create the ribs. The tops of the ribs are snipped with the shears. Inflation begins, and the bubble grows. The bubble is divided in two. The outer half will become the body of the ampollina; the uppermost part will become the neck. A constriction is made near the blowpipe. Eventually the bubble will be separated from the blowpipe at this constriction. A thin thread of glass is trailed on. This is reheated, and the glass is further inflated to partially melt the trail in. Glass is added to the tip. This will become a merese or disk. The foot will sit on this disk, and the foot is made by gathering a tiny amount of glass on the end of the blowpipe, marvering it perfectly round, blowing a small bubble into the glass, and then lowering that bubble onto the merese. The rim of the foot is created by making a constriction and knocking free the excess glass. A small tube or chimney is created at the edge of the foot and made perfectly cylindrical. This is rolled over a piece of gold leaf. After reheating, the jacks are used to open the foot to its final shape. The vessel is transferred to the punty (or pontil); the neck is broken with a slight tap. A decorative trail is added at the juncture of the neck and the vessel body. This is tooled. A decorative trail of aqua glass is added near the top, and after a chimney is made, more gold leaf is added to what will become the rim. An edge wrap of aqua glass is added before the rim is given its final shape. The puffer (or soffietta) is used to inflate the glass and make this, the final opening, easier. Dollops of aqua glass are added and pressed with the raspberry prunt tool. The spout is formed by taking a large gather of glass, pressing the gathering rod into the wall, and creating a cavity. This is spun and elongated to create the spout. The excess glass is trimmed free, leaving a hole in the tip of the spout. A tiny amount of aqua glass is trailed around the edge and, after reheating, tooled to become the final shape. The handle is hollow. It’s added similarly as the blown foot was added—but here, to the side. 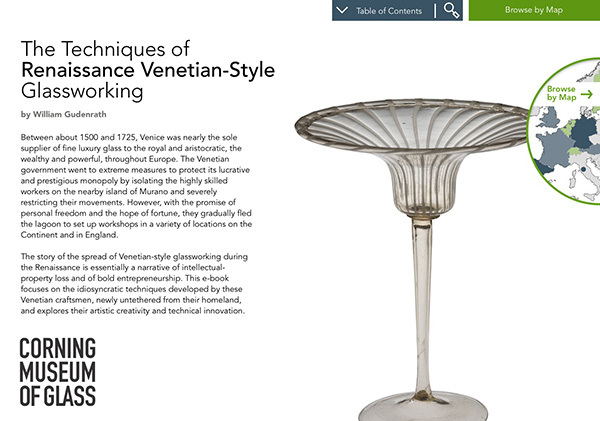 A trail of glass is added to the handle, pressed with a waffle tool to create a decoration. 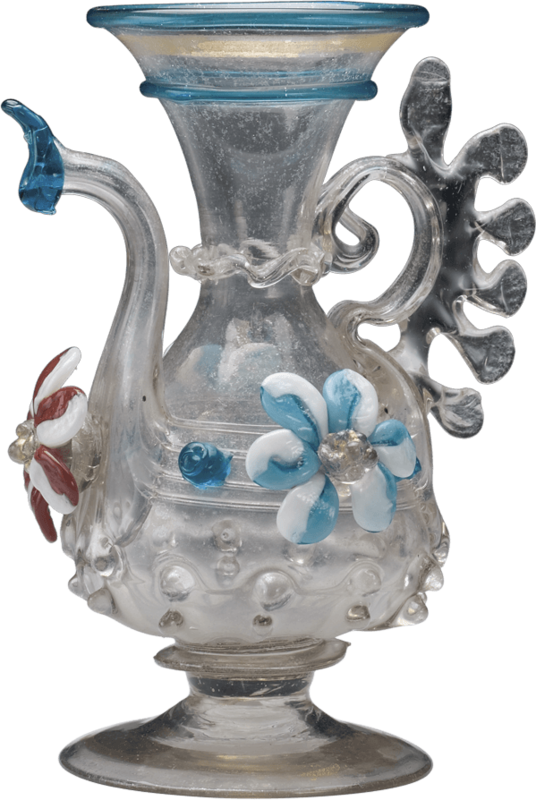 A tiny amount of glass is added to the base of the spout, and the flower pressed on. This is repeated for the remaining two flowers. Everything is heated to about 1000 degrees Fahrenheit, and the vessel is broken free of its punty.